Our programmable devices (such as TPP2 and TPP3) have the unique ability to process input from card readers with clock/data or Wiegand interface. This is achieved through the ser. 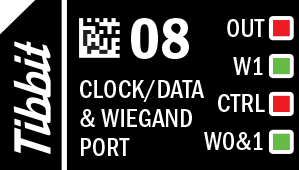 object running in the clock/data or Wiegand mode. Tibbit #08 implements necessary hardware. In order to be able to process card reader output, this Tibbit has to be connected to the RX and CTS lines of the CPU's UART (see [SER]). When connecting a clock/data reader, wire the clock line to IO1, and the data line to IO2. Set the CONTROL line to LOW -- this selects the clock/data mode for the Tibbit's hardware. When connecting a Wiegand reader, wire the W0 line to IO1, W1 line -- to IO2. Set the CONTROL line to HIGH to select the Wiegand mode. Most card readers with clock/data and Wiegand interfaces have open collector outputs. Such outputs require pull-up resistors on the receiving end. On this Tibbit, the role of pull-up resistors is played by opto-LEDs and resistors connected in series. The original version of this Tibbit required 5V power to be connected to the IO line 3. On the new Tibbit #08 of the revision B, line IO3 is connected to the internal 5V power (the diagram above shows this modification in red color). This modification spares you from the necessity to provide external power for pull-ups. You can even use IO3 line to power your reader (if the reader can run on 5V and your TPS system has enough spare power). Revision B devices are marked by a small round sticker with letter "B". The sticker is on the side of the Tibbit. Tibbit #08 has a standalone open collector output controlled through LINE D. Set LINE D LOW to open the transistor. When left unconnected, the line defaults to HIGH (hence, the transistor is closed). Combine this Tibbit with terminal block devices -- #20 (nine terminal blocks) or #21 (four terminal blocks). Note that #21 doesn't provide the ground line, and using this Tibbit requires the ground line between the reader and your system. Hence, if you use Tibbit #21 you will need to "steal" the ground somewhere else. Check out the Tibbit #11 (four open collector outputs) if you are looking to emulate clock/data or Wiegand reader output (that is, of you want to turn your device into a reader that outputs data). There are four LEDs: two red and two green. Red LEDs are connected to the CONTROL and OC line. Green LEDs are connected to W0&1 and W1 lines. All LEDs are buffered (with logic gates) and light up for the LOW state of control lines.